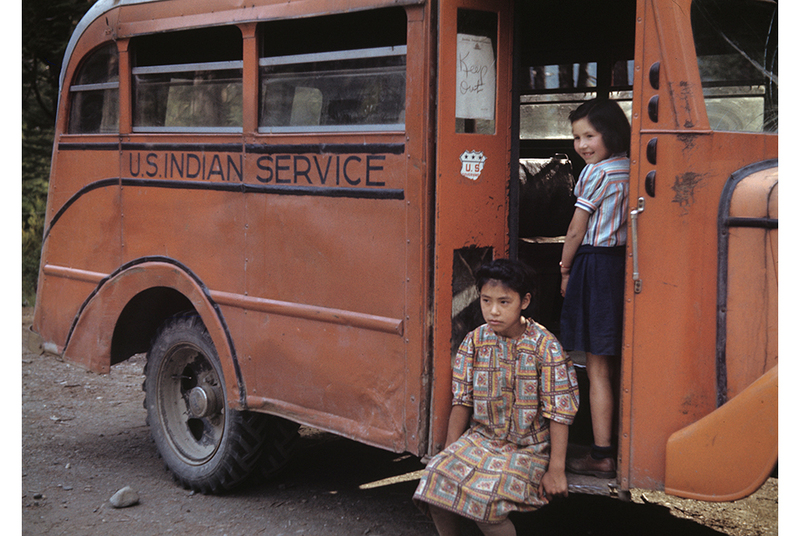 Ruth Gruber, Students waiting on a U.S. Indian Service school bus, Ward Cove, Alaska Territory, 1941–43 © Ruth Gruber. MIAMI, FLA.- The Jewish Museum of Florida-FIU presents the southeastern U.S. premiere of Ruth Gruber: Photojournalist. Headlining Art Basel season in Miami Beach, the new exhibition celebrates the remarkable life, vision, and heroic tenacity of this twentieth-century pioneer and trailblazer. Once the world’s youngest PhD, Ruth Gruber passed away recently at the age of 105. The show features more than 60 photographs including gelatin silver prints plus an archival trove of personal letters, telegrams, printed magazines, and assorted ephemera documenting the artist’s career. The photographs in this exhibition span more than fifty years, from Gruber’s groundbreaking reportage of the Soviet Arctic in the 1930s and iconic images of Jewish refugees from the ship Exodus 1947, to her later photographs of Ethiopian Jews in the midst of civil war in the 1980s. A selection of Gruber’s vintage prints, never before exhibited, will be presented alongside contemporary prints made from her original negatives. This exhibition is on loan from the International Center for Photography (ICP) in New York, is drawn from Gruber’s private archive, and was organized by ICP Curator Maya Benton. The Miami presentation is organized by Jackie Goldstein, Curator of the Jewish Museum of Florida-FIU. The opening reception is free to Members of the museum (non-members pay $18), on Monday, October 16 at 7:00 p.m. and will include a screening of the film Ahead of Time, about Ruth Gruber’s life. The museum is located at 301 Washington Avenue, in the heart of Miami Beach’s historic Art Deco District. All images are ©Estate of Ruth Gruber, courtesy International Center of Photography. Captions to the three photos above, from left-to-right, are: 1.) Ruth Gruber, Alaska Territory, Unidentified Photographer, 1941. 2.) Eklutna woman reading LIFE magazine, Hooper Bay, Alaska Territory, 1941. 3.) Proud father putting his baby to sleep in a bassinet he constructed from gathered rags and pieces of wood, Cyprus Internment Camp, 1947. As the first correspondent granted permission to travel throughout the Soviet Arctic and Siberian gulag (1934–35), Gruber documented frontier life in the Arctic and the unique role of women in the establishment of northern towns and ports. Vintage photographs represent her earliest use of the camera as a component of her reportage, and trace the exploration and settlement of the world’s northernmost frontier and the development of the Soviet Arctic. Gruber was thirty years old and already a celebrated author, lecturer, and intrepid reporter when, in 1941, U.S. Secretary of the Interior Harold L. Ickes appointed her Field Representative to the Alaska Territory. Gruber traveled throughout the Alaskan frontier, an enormous and largely unknown expanse, and established herself as a serious photographer. She sent reports to the Department of the Interior on Alaska’s vast natural resources, railway and air routes, opportunities for homesteading, lives and customs of the native Eskimo people, conditions and experiences of American soldiers stationed there, and suggested ways to open up the territory. Ruth Gruber: Photojournalist will include color prints made from her original Alaska slides, 1941–43, printed for the first time, as well as never before-seen motion picture footage. In 1944, Gruber was assigned a secret mission to bring nearly 1,000 Jewish refugees from Europe to the U.S. Born in Brooklyn to Jewish immigrants, Gruber accepted the assignment despite the obvious danger it presented. She was appointed as a U.S. Army General for the ship Henry Gibbins, stewarding the ship and its 1,000 refugees to American shores. From that moment on, Gruber’s life and work were inextricably bound to the lives of refugees and dedicated to rescue, sanctuary, and liberation. Her tools were her boundless tenacity, empathy, razor-sharp intellect, a Hermes typewriter, and a camera.